If you need to whip up a quick and easy dessert for your Christmas feast, this delicious gluten free chocolate cream pie is the perfect addition to your menu. It takes only ten minutes to prepare and then sets in the refrigerator while you finish enjoying your holiday dinner. Absolutely no cooking required. This pie used to be a staple at every one of our holiday meals. When my family adopted a gluten free diet, I searched high and low for a substitute for the signature graham style crust. Last week my search finally came to an end when I found MI-Del’s gluten free graham style pie crust at the grocery store. I couldn’t wait to get home and make this chocolate cream pie. We haven’t had this pie in over ten years, and my kids couldn’t wait to taste it. The crust was crunchy and held together well without needing to be baked in the oven. It’s the perfect contrast to the layers of chocolate pudding and whipped topping. 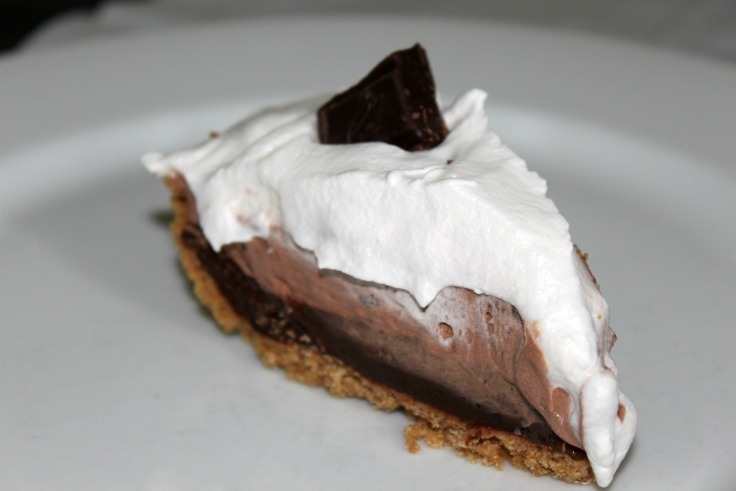 Ready to make your gluten free chocolate cream pie with MI-Del’s graham style pie crust? Here we go. Finally, top your pie with the remaining truwhip and refrigerate for 4 hours. I hope you enjoy this pie as much as we do! Have a happy and healthy week. Gluten Free Chocolate Cream Pie with MI-DEL's Graham Style Pie Crust is a quick easy delicious dessert. Combine the milk and pudding mix in a large bowl. Spoon 1 1/2 cups of the mixture into the crust. Stir 5 ounces of truwhip into the remaining pudding mixture. Then, spoon on top of pudding in the crust. Finally, top with the remaining truwhip. Refrigerate for 4 hours. Slice and enjoy. I just had to pin this recipe. Thanks so much for the share 🙂 My family has been gluten free ever since my son was diagnosed with a wheat sensitivity at four months. Excellent. You’re all going to love this pie. YUM! This pie sounds awesome. I’m going to share it with my co-worker because she’s on a gluten-free lifestyle. thanks so much!